Full-service production management with issue-based or article-based workflows. Working with Cenveo Publisher Services translates to the right solution, at the right time, for the right price. With full-service editorial and production offices both on-shore and off-shore, we have the ability to “right-shore” a solution that best fits into a publisher’s requirements. Transforming publishers' content from manuscript to designed pages in record-setting speed. With our combination of on-shore and off-shore resources using Smart Suite, shelf-time is reduced by up to 4 days. Custom quality control checks and validation integrates with multiple publisher-specific schematron rules. Our customers are seeing conversion error rates drop dramatically while the speed of proofs increase exponentially. In just 1 year, the average on time delivery rates have increased and positioned Cenveo Publisher Services as the preferred vendor for some of the world's leading academic and scholarly publishers. While on time delivery rates consistently average in the 99% to 100% range, early delivery rates are also increasing. The customer data depicted here represents average delivery rates during a 12-month period for various customers. 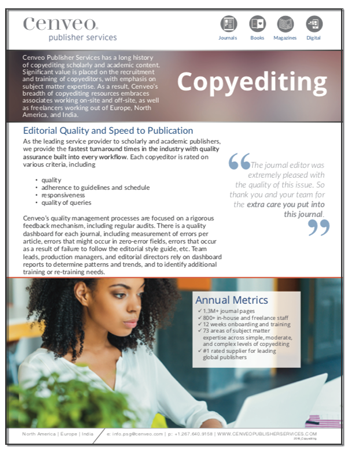 Over the past 2 years, Cenveo Publisher Services has increased turnaround times, while improving editorial KPIs. Tell us a bit about your current production workflow.